Download, complete and mail a voter registration application. You can go to the Candler County Election Supervisor’s office, public library, public assistance office, recruitment office, schools and other government offices for a mail-in registration form. Registration is offered when you renew or apply for your driver's license at Department of Motor Vehicle Safety driver's license posts. When registering to vote in person, please bring with you a Georgia Driver’s License or state-issued photo I.D., or a copy of a current utility bill, bank statement, government check, paycheck, or other government document showing your name and address. The Candler County Election Supervisor will issue a precinct card after reviewing and processing your application. Please allow the county at least 3 to 4 weeks before contacting the Election Supervisor’s office. If you DO NOT have one of these forms of ID, you can receive a FREE Georgia Voter ID card by contacting the Candler County Election Supervisor’s office. On Election Day, you must vote at your designated polling place. Your assigned polling place is shown on your voter registration card. Polling places are open from 7 a.m. to 7 p.m. on Election Day. If you are in line at 7 p.m., you will be allowed to cast your vote. When you get to your polling place, proceed to the check-in desk and fill out a voter’s certificate with your name and address. Next, show your photo ID. 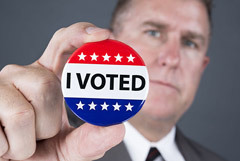 A poll worker will then check your photo ID, verify that you are registered and at the correct polling location, issue you a voter access card or ballot, whichever is applicable, and allow you to vote.